Want to wear leopards without the Pat Butcher 'rude? While there's nothing wrong with that in my books, this camouflage scarf from Scottish designer Helen Ruth is a beautiful way of slipping a spotty number into your outfit. Its floral-skinned felines and vibrant colour combination is simply sumptuous! I adore this abstract take on a beach from the Not The Kind giftshop. It's an on trend way to bring a landscape scene into your home. The beach hut vibes really reminds me of my recent Brighton visit, which makes me smile. Sticking with the holiday vibe of this month's wishlist are these gelato shoes from Miss L Fire (and they're on sale!). The great thing about combining retro style with a novelty twist is that it makes them surprisingly timeless. Wear them every time the sun peeps out! I really like ice cream, okay? I may have scoured the internet for the best ice cream accessories... Lou Taylor has nailed the nostalgia of the 99 with these fun statement earrings. I love a collab and I was very excited for this collection. The ASOS x MTV is attention grabbing with it's bold colours and graffiti prints. A few pieces are not quite right for me but this one is the perfect mixture of brash and demure that it's top of my lust list. I spied these necklaces when visiting the Scottish Gallery of Modern Art. I always love checking out the shops when I visit galleries because they're usually filled with some awesome independent designers and special collaborations. I had seen One We Made Earlier's designs online before but they look even better in real life! And they have lots of different colour combinations. I love this one because the black and white contrasts beautifully against the bright yellow. Speaking of yellow, have you noticed a bit of a theme? I'm very much appreciating this sunny colour at the moment, be it a splash of the shade or an all over look. I'm also really enjoying a white tee with a fun slogan and this one from Big Bug Press caught my eye when browsing Instagram. To be honest, all of their photos catch my attention. Bright, solid colours and kickass accessories - it's a total feast for the eyes! More yellow mixed with black and white. I currently have a bucket bag that I got in the H&M sale a million years ago but it's now starting to fall apart. I love the shape because it allows me to fit all of my crap in there so maybe I need to replace it with this much more fun version. I love the grid pattern and the pops of colour. It also comes in green if that's more your hue. I find enamel pins are the easiest way to brighten up my outerwear. Sticking a few on the collar of my denim jacket can instantly make it look more interesting and tie it in with the rest of my outfit. 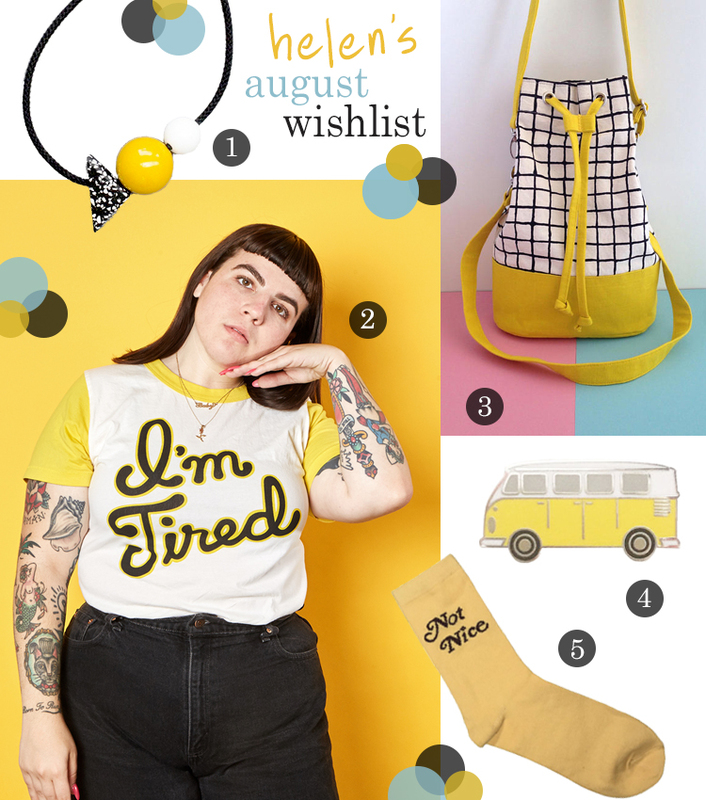 What with all the yellow I'm loving at the moment it looks like I might need some matching pins. This campervan one by the lovely Hello Sunshine is perfect for wearing on summer adventures. Socks can just be boring essentials but it's always more fun if you take a page out of Jon Snow's book (the news presenter not the Game of Thrones character) and go with something a little more interesting. The colours of these ones remind me of the Brownies uniform but the message is a bit cheekier. Of course, I might be too nice to wear them. I don't want my feet to be telling fibs. Can highly recommend Miss L Fire shoes. They're pretty pricey - although not abnormally so for a small-scale designer - but they're so comfortable and last forever. 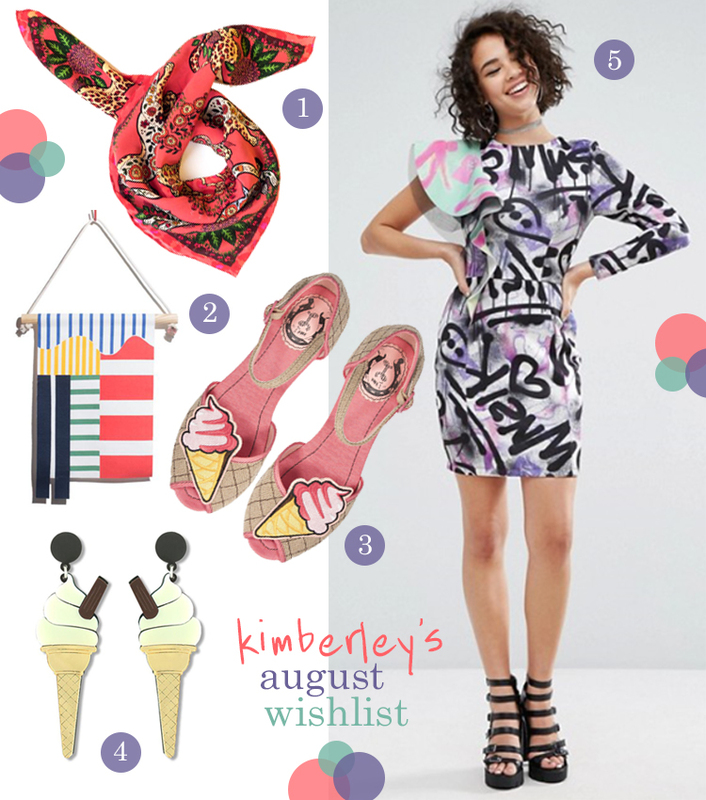 Plus, ice cream cones! What's not to love? !